Peace of mind from Maxxis at no extra cost and FREE wheel alignment check and tyre safety check for lifetime of tyre with LTC tyres. If wheel alignment adjustments are required on the vehicle a no obligation quote will be provided. 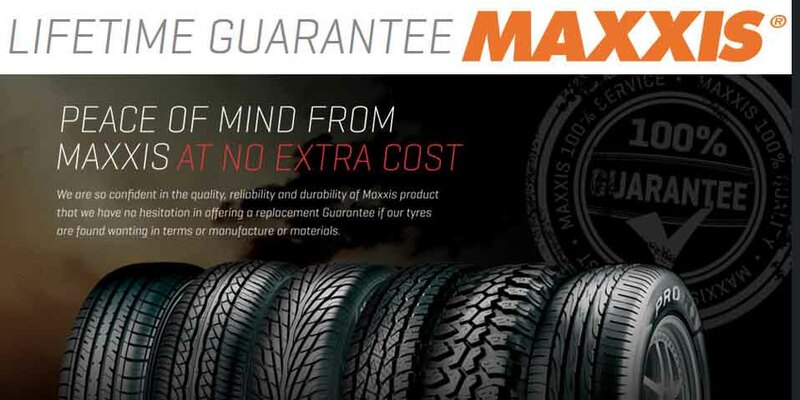 We are so confident in the quality, reliability and durability of Maxxis products that we have no hesitation in offering a replacement guarantee if our tyres are found wanting in terms of manufacture or materials. This confidence is based on the knowledge that Maxxis tyres undergo such a rigorous development process before being brought to market. This cornerstone of Maxxis corporate strategy has been pivotol in its success and continues to raise the bar for standards in the whole industry. Maxxis will replace a tyre which demonstrates a defect due to the manufacturing process or materials used. Maxxis will replace a tyre which show irreparable damage resulting from normal road use. This guarantee operates independently of the purchase date and is non transferable from the party named on the guarantee certificate. This guarantee does not affect your statutory rights. Replacement is based on dealer assessment where a replacement value is calculated based on the amount of tread used. The cost of your replacement tyre is covered, however, there may still be a charge for fitting and balancing, please consult your Maxxis dealer. Grip diminishes progressively with wear and as a consequence stopping distances, especially in the wet, become greater. In order to ensure you receive the maximum life from your Maxxis tyres and to validate the guarantee, LTC tyres require you to visit any LTC tyres branch for your FREE wheel alignment check and tyre safety check every 6 months from date of purchase Tracking and wheel alignment should be checked at regular intervals. Poor alignment and tracking causes irregular and rapid tyre wear resulting in the need to replace tyre more frequently. Inspect your tyres for usual damage If cuts or bulges in the sidewall are visible, take the tyre to your tyre retailer immediately. Uneven wear can identify issues with tracking, wheel alignment and axle geometry. Regularly examine wheels for deformation and damage which could in turn damage the tyre. If a tyre suffers a violent impact, have it checked over at your tyre retailer as soon as possible, even if there is no visible damage. To make a claim under the terms of your Maxxis guarantee, please take your tyre(s) to your local Maxxis dealer. (The use of the guarantee in respect of tyre(s) invalidates any further claims). A tyre with 80% or more tread remaining will be replaced with a new Maxxis tyre of the same size and type (or corresponding type if range has changed). Tyres with less than 80% of the tread remaining will be replaced subject to changes based on the flooring scale. Proflow custom built stainless steel exhaust systems to suit any vehicle. Van-tech van accessories to suit VW T4,T5,T6, Ford Transit, Vauxhall Vivaro + many more vans.